How could a restaurant in downtown survive without serving alcohol beverages? Do you know what retails will be in the cornerstone building? Is it the dealearship? Is the bowling alley still going to be there? Does anybody think that the curve part of the superchannel building use very ugly glasses? I'm not sure if this has yet to be shared on this forum, but I came across this on line and thought it might be worth posting. A selection of downtown buildings and scenes. ^ I dont believe that has been posted. thanks. I know that United Heritage is taking a portion of the first floor of the Cornerstone. But I could have sworn that I read somewhere (Journal maybe?) that a Bentley/Rolls Royce dealership called exotic car store (out of manhattan) was setting up shop there. Does anybody remember seeing this or am I completely losing it? I think I posted the article about the Bentley dealership on here a while back but haven't heard about it since. Of course, you could be losing it anyway. ^ I think the car dealer was going in were the cancelled Benchmark was going to be. Orlando developer Cameron Kuhn said Thursday he's scuttling plans for a 10-story office tower in a downtown block targeted for redevelopment, though he's pushing ahead with retail plans that include a luxury-car dealership. Earlier this year, Kuhn said he would build a 400,000-square-foot office tower atop a city parking garage in the block bounded by Orange Avenue, Washington Street, Jefferson Street and a city parking lot. Kuhn said "several factors" prompted his decision to cancel the tower, including rising construction costs and the political uncertainty caused by Mayor Buddy Dyer's indictment and suspension from office last week. City Commissioner Patty Sheehan said she was surprised at Kuhn's decision and she wonders if he had "too many balls in the air" with his other development projects downtown and is "using this as an excuse." Nevertheless, Sheehan said Kuhn's action is something of deep concern to the city. The political and economic ripples from Dyer's indictment has created "tremendous uncertainty. Investors get leery. My hope is that we can get this behind us very quickly. I'm hoping that the council can create a level of certainty for the community." Kuhn insisted he doesn't think the area's office-condominium market is overbuilt, despite several projects in the pipeline. "I may yet do a tower on another site in the future," he said. Redevelopment of the block's retail space and the former JC Penney department store will continue, he said. The JC Penney building is being renovated for office-condo and retail space. Work is to be finished in June. The developer said he has a deal for an "exotic car" dealer to open a showroom in 25,000 square feet of retail space within the block. He said Exotic Cars Inc. of New York plans to open dealerships for such cars as Rolls Royce and Bentley in Orlando, Miami and West Palm Beach. The car dealership would be the second to locate in the city center in recent years. Downtown Mini Inc., which sells the British Mini cars, opened in 2001 at 131 N. Orange Ave.
That dealership moved into retail space renovated by Kuhn. Two other dealerships -- one for cars and another for motorcycles -- are considering locating downtown, he said. He would not identify those dealerships. When Downtown Mini opened, it was the first center-city car dealership in more than a decade. Kuhn's redevelopment of the so-called Jaymont Block at Orange Avenue and Church Street is under construction. That project -- called Premiere Trade Plaza -- includes two office-condominium towers; a residential tower with 306 condominiums; 105,000 square feet of retail, and a 12-screen movie theater. The city provided $22.5 million in incentives for the project. You expected the Superchannel people to have good taste? Actually, yesterday when I drive through there, the building changed colour. Yeah, that one woman has pink hair for christsakes! You got your miracle ! Oh, that's Benny Hinn's line, I think. The Sanctuary is looking good and I didn't realize the Star tower had a sign up. Nice! Great pics. The skyline is definately changing. Awesome pics! Downtown still looks rather sleepy, even w/the current construction. I think those pics show the calm before the storm...2006 will be the year of the cranes! When was the library built??? Does anyone have an explanation as to WHY it looks so... um... UGLY? Cost issues? Damn thing looks like a hurricane / fallout shelter! Any chance that it'll be "refurbished" to fit into the whole "city beautiful" idea? Hell, I'd even take another (F)BBARCH building instead of this one! The Orlando Public Library was designed by Brutalist architect Johanson (sp?). I for one think its a great design considering the style. wow, wellesey looks nice. 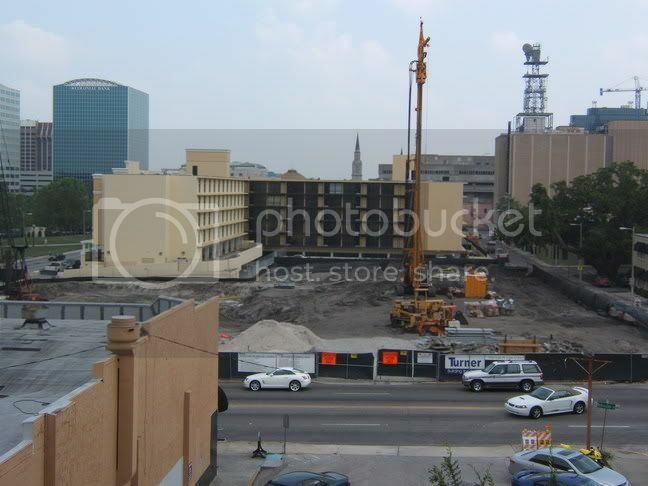 Site reminds me alot of the plaza... going to give college park some nice density.